Lower admission prices, a doubling in size of the event space footprint, and more opportunities for fans to engage personally with Thoroughbred racing’s biggest international celebrities are among the tweaks in the works for the second annual Equestricon convention. The two-day, fan-centric celebration of the sport, which debuted at Saratoga last summer and is the grass-roots brainchild of a trio of Thoroughbred entrepreneurs, is shifting venues to dovetail with the Breeders’ Cup in Louisville for 2018. The trade show’s founders–Kathryn Sharp, Justin Nicholson, and Dan Tordjman–announced back in January that Equestricon would partner with the Breeders’ Cup this year, kicking off the week of championship racing with Monday and Tuesday (Oct. 29 and 30) festivities at the Kentucky International Convention Center, which is a straight shot four miles north of host track Churchill Downs. With those scheduling details now locked into place, the Equestricon team is busy behind the scenes trying to improve upon last year’s extravaganza, which ended up being one of the more pleasant surprises of the Saratoga meet and was generally hailed as a unique and successful endeavor because of its focus on inclusivity and positive vibes. Specific details about panels, workshops, celebrity appearances and ticketing will be announced over the next six weeks. 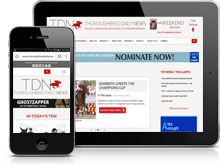 But co-founder Sharp disclosed some of the changes in the works in an interview with TDN. “We’re an independent organization. It’s just the three of us. We’re kind of a small and nimble group, not beholden to anyone, so we get to make a lot of decisions ourselves,” Sharp said. It took only a relatively quick 18 months for the initial Equestricon to grow from the “what if” concept to the hosting of the actual event. This time around, the time frame is shorter, but the team has the benefit of relying on extensive exit survey feedback from attendees as it plans for year number two. The inaugural Equestricon attracted more than 1,500 fans, horseplayers, and prospective racehorse owners from 34 states and seven countries, and featured appearances by hundreds of racing personalities, industry leaders, and major organizations. “Fans were really engaged,” Sharp said after sifting through the survey data. “They wanted to tell us what they liked and didn’t like. Fortunately, most of them liked much of the experience. But I think on the programming front there was a bit of frustration” over conflicting events, such as a panel discussion overlapping with an autograph session, meaning attendees had to choose one or the other. “We had 24 different panels over two days, which was a lot. So we probably over-programmed the event, and I think this year we’re really going to try and focus on reducing some of that programming to keep it a little bit more targeted and open to a larger audience,” Sharp said. Sharp said the celebrity access aspect underscores one of the plusses of moving the event to Breeders’ Cup week, because she expects far more international human stars–present and past–to be in Louisville at the same time as Equestricon. “Fans can expect to see a lot of those really big names participating in a way that maybe they didn’t see last year,” Sharp said. Ticket prices, which last year ranged from $25 general admission to a $450 VIP package, are being revised downward for 2018. Sharp said the newly official partnership with the Breeders’ Cup evolved from a close working relationship the two entities had in 2017. “They were one of our biggest supporters,” Sharp said. “And I think we kind of always envisioned Equestricon being something that would fit naturally with the Breeders’ Cup. They’re this independent organization that gets along with everyone, and we have kind of a similar brand identity that way. Although he actual trade show will take place on the Monday and Tuesday prior to the championships, Equestricon will have a week-long presence and involvement with the Breeders’ Cup, Sharp noted. But that drawing-people-to-Louisville aspect could prove to be the biggest challenge for Equestricon in its second go-round. Saratoga in the summer is a pilgrimage for many racegoers, not just because of the racing, but because it’s a popular vacation-taking time when the weather is sunny and warm. Louisville in late October could be a tougher sell. But Sharp was armed with a data-driven answer when that question was put to her. She pointed out that 60% of Equestricon’s exit survey respondents traveled to get to Saratoga’s convention last August. Of those who traveled, 70% indicated they came specifically for Equestricon. And within that subset, Sharp noted that “a majority” of people had never been to Saratoga Race Course before, indicating that Equestricon had given them a reason to plan a destination trek they might not have otherwise taken. Equestricon is still accepting applications from exhibitors for 2018, and Sharp wanted to get the word out that the doubling in size of available exhibit space means rental pricing for vendors has also been sliced. According to a recent article in Louisville Business First, the Louisville Convention & Visitors Bureau is reporting that 455 hotel room nights have already been blocked for the convention, which projects to an estimated economic impact of about $460,000 (those figures don’t include the potential impact from attendees who have not yet booked). Sharp said Equestricon is still such a new, evolving concept that a commitment of following around the Breeders’ Cup from year to year is not etched in stone. But Sharp does have longer-term plans for what she’d like Equestricon to look like in a few years.